Last week we asked you to guess the new feature we've been working on lately. The correct answer is: we are launching two new regions - Australia and Asia - by the end of the month. Today's demanding clients do feel the difference of speed regarding app usability. An improvement in the loading time is a pretty good reason for more positive reviews on the app stores, and let's be honest, the positive reviews are the currency of the app development market. 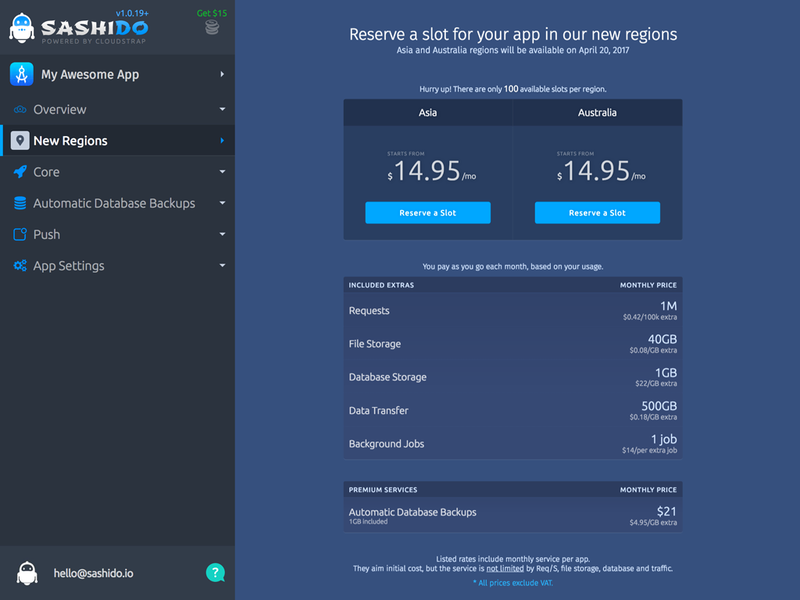 We know it's crucial for you to be located as close as possible to your users in order to give them the best possible user experience, so we are providing you with these two new options to choose where to host your app's data. We will be ready to migrate apps in the new regions by the end of the month (April 21) and until then you can reserve a spot there. As a starter, these new locations will be very limited - only a hundred apps per region - so hurry up and secure a place for your app in advance. You can reserve a spot in the new regions from your app's dashboard in New Regions section. From there you will be able to see the prices that apply to these new locations as well. On April 21, we will proceed with the migrations, and when it’s time for your app, we will contact you via email to walk you through the process and to schedule the most convenient time for action.